Missed last week? Nooo! Anti-miss it now: Volvo Performance Suspension Upgrades. Take the Fast Friday Poll. Tune a HPT or LPT. Wait, a LPT? I received a request from a FF subscriber a week ago about suggested upgrade routes for different models. This subject could be lengthy enough to cover a few Fast Fridays so we’ll keep this focused on the main Volvo models and engine configurations that are most common and frequent in the US market. This week we’ll cover the differences between the LPT and HLP engine blocks. Volvo engine configurations are pretty wide spread globally but for us in the US the preferred engine variants for performance are the turbocharged Low Pressure Turbo (LPT) and the High Pressure Turbo (HPT) engines. As the names imply the difference is in the total pressure the turbo is programmed to make relative to the engine configuration it’s bolted up to. LPT motors have a higher initial compression ratio that inclines them toward a lower maximum boost target. LPT motors also tend to have a bit steeper torque curve from this added compression. As such this means total boost is generally less than their HPT counterparts and timing curves tend to be less aggressive as well, meaning that the horsepower curves are a bit flatter as compared to the HPT engine. This isn’t to say the LPT engine isn’t a good platform to start from for performance. 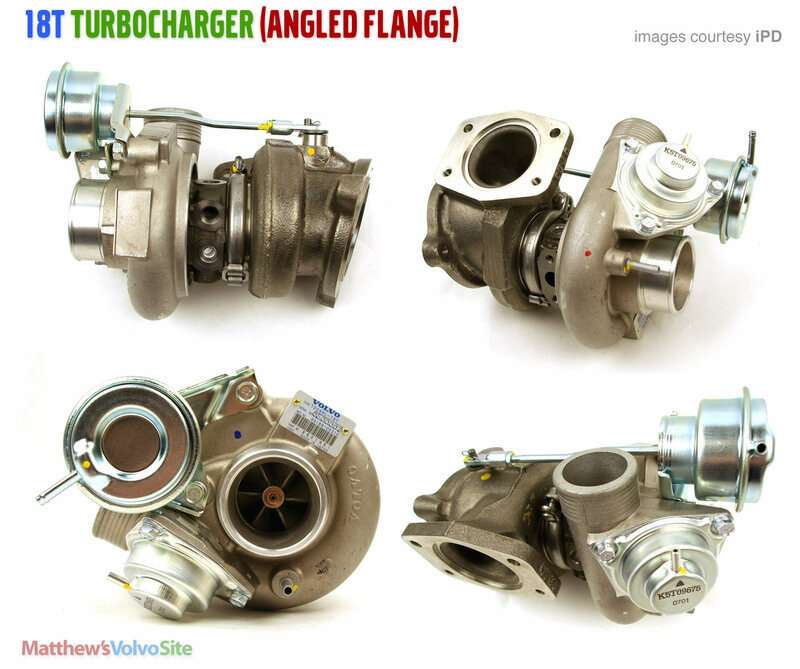 Upgrading the stock LPT turbo to a larger 16T or 18T isn’t as crazy as you might think. The added compression is a factor but doesn’t prevent these engines from generating some serious performance increases. I have a current customer with a 2000 S70 GLT FWD with a 19T installed, and while this car is ME7, which means there are more sensors to help the ECU manage this increase in flow, it’s been a real surprise to see how far we can push the engine without running into detonation as quickly as we expected. Running the 19T at 16psi for over 40K on the odometer since the upgrade and tune, we’ve been very excited to see how much sturdier these engines are than we initially thought. This particular setup isn’t something that I would advise most folks but since he’s local and a friend we’re working together to explore the limits of the LPT blocks. With some water injection and perhaps an intercooler we’re looking to run 18psi on this block later in the fall. With a slightly lower initial compression ratio the HPT block is well suited to higher boost pressures and more aggressive timing curves as the detonation ceiling is naturally higher than the LPT blocks and therefore power development is much different. The typical upgrade path for this engine is an 18T or 19T although the more mild 16T can be a good upgrade for 850 models that have the 15G installed stock. Since both HPT and LPT models use the same intercooler you can surmise that the lower the boost pressure the better job the intercooler does as the boost charge temps don’t rise so high and the flow so much that the intercooler can’t keep up. That’s why as you look for more and more power from these engines you start to have a number of supporting components that need upgrading. At the end of the day each has its value and it’s place in the Volvo world. I for one would not trade my 99XC with 16T and Green tune for an HPT in the same car even if the peak power was higher. I need the additional off the line torque to keep the car feeling nimble and ready to ‘pounce’. At the same time I love going for a drive in the 18T 850 with M4.4 Blue tune I have as well... but for an entirely different reason. Get to know the folks in your local Volvo community so you can get to know the different engines, supporting mods, and driving characteristics that each configuration can provide. That will help you make the performance and upgrade choices that best suit you better than any article can! Not sure what engine you have in your car? VIN will tell you all you need to know to look up the specs on your engine and vehicle model. Use the resources here at MVS to get the info you need about the upgrade path that might be right for you! Re: FF#11: Tune a Low Pressure Turbo? I really like these fast Friday posts. They are very informative, concise and well written. Keep up the good work!! Just my 2 cents...both types of engines are a lot of fun in different ways. My Volvo was a T5 and really, REALLY slow to get up and get moving. But above 4,000 RPM, the end of 1st gear and passing power in 2nd gear was incredible. Once it gets moving, it will really pull - even with over 200,000 miles on the motor. Torque for climbing hills or changing lanes on the highway wasn't bad above 3,000 RPM either. The Cruze weighs almost the same as the Volvo does, but has a 1.4 liter engine and a itty bitty turbo that runs about 16 PSI (much less CFM than the Volvo turbos). It spools up almost instantly, and because of the instant torque, the car is a little rocketship through 1st, 2nd, and 3rd gear. Then the weight and small engine catches up to it, so once you're relying more on HP than torque, it has no highway passing power whatsoever. I've driven both a Cruze and a GLT Volvo (stock 13G) with a tune - much, much improved over the stock versions, and personally, I much prefer the powerband of the LPT cars to that of the HPT cars like a T5 or WRX. Having to wait for power (or a stupid automatic transmission to find the right gear) when I want to move in traffic right away really, really annoys me. For the followup, can we get some discussion about the effects of various turbo and exhaust sizes on the LPT engines? At first blush, bolting an 18T onto it is going to make it feel a lot more like an HPT. I'd be interested in squeezing more performance out of it, but not at the expense of that early full torque delivery. These GLT's are all about immediate response; sitting still one moment, raising hell the next, and then just as quickly blending back in with the sheep. My first uneducated guess is to combine a 15G wheel with a turboback, or perhaps a 16T if also combined with an angle flange, but is there any real improvement to be had without turning it into a four-wheeled Harley? c70_lindsay wrote: I really like these fast Friday posts. They are very informative, concise and well written. Keep up the good work!! jblackburn wrote: Great post, Matt. On behalf of Lucky, thanks! FWIW, and somewhat on-topic, my T5 is getting faster. By itself. The temperature is falling as Fall comes on, and this helps these HPTs make more power on the same principle as Water Injection. Maybe (probably in some degree, no pun intended) LPTs too, I don't know. A week ago I did a WOT at a green light and the wheels spun a small chirp at 30 mph. That hasn't happened ever. I added an MBC a half a year ago. I immediately looked down at the outside temp gauge and sure enough it read around 30 degrees cooler than the (abnormally hot) summer daytime temperatures have been. Now they happen every time the temperature is below 70 F.
kcodyjr wrote: For the followup, can we get some discussion about the effects of various turbo and exhaust sizes on the LPT engines? At first blush, bolting an 18T onto it is going to make it feel a lot more like an HPT. You make a good point, Kcody. I'll defer to Lucky. I'd be happy to cover more info about turbo/exhaust pairing for this upcoming Fast Friday article! I just upgraded my '97 855 GLT from the stock LPT to a TD04HL-16T. It's not so much a project car but when I have the chance to upgrade something, I do my best - it's really a daily driver for my daughter. I've been running the IPD TurboBack for a while and just picked up an R "Japan" exhaust manifold (not sure when I'll have time to install it). I’m toying with the idea of getting some white injectors, too. As it is, when I mash the accelerator I can make the wheels squeal off the line which makes me squeal as well! Question is this; should it get a tune based on the upgrades I have? I’m confident a tune would add improvements, but I‘m really curious if running these upgrades without a ‘proper’ tune might actually reduce fuel economy or cause a situation where I’m causing more harm than good? I'm interested in how your car operates if you change the injectors. Erie vovo has the green injectors with the rail for $125. That seems like a very reasonable price. But without a tune, are your new injectors doing any good. My concern would be the engine and ecu expecting a certain flow from the base orange injectors, and with the green injectors installed, could the motor be getting a lot more fuel then is expected, and what damage could that do? I'm sure the answer is get a tune! lol. Bigger injectors without retuning will make an engine run rich and in a worst case scenario it can wash the cylinders down and potentially cause engine damage. That's not terribly likely but it can happen. Otherwise larger injectors are fine, with proper tuning!